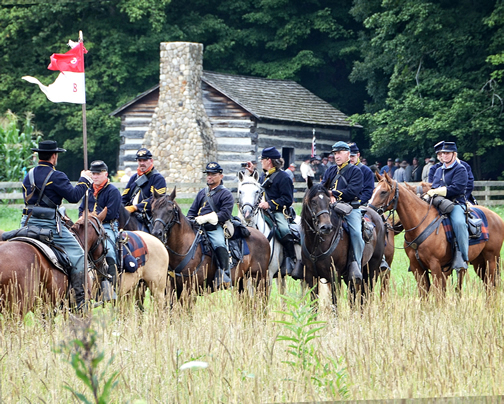 Thousands of visitors and reenactors flock to Hale Farm & Village annually for this popular summertime event—the largest annual Civil War reenactments in Ohio. Meet soldiers, cavalry and civilians. Hear the sounds of battle and smell the gunpowder. Shake hands with President Lincoln or shop for a hoopskirt. Don’t miss the excitement! On Saturday, August 11 at 2:30pm and Sunday August 12 at 2:00pm, visitors can experience the recreation of the first day of Gettysburg. This year we honor the soldiers who fought in this pivotal 1863 Battle. For over 150 years, the Battle of Gettysburg has rightly been hailed, by many historians, as a turning point in the American Civil War. It was at this tiny Pennsylvania crossroads village that the Union Army of the Potomac repulsed the Confederacy’s Army of Northern Virginia. Public Event Tickets: $10 adults (ages 13+); $5 youth (ages 3-12 yrs); members, youth 2yrs and under & active military are free. Two-day tickets are available – Adults $15, Youth $7.50. Museum exhibits close temporarily during the Battle. Only service animals are permitted on property. NO DRONES PERMITTED ON PROPERTY. Call us for more information 330-666-3711 x 1717. All Hale Farm & Village Civil War Reenactment participants are required to register for the event. The registration fee is $10.00 per person age 18 and older. Minors must be accompanied by a legal guardian and are admitted free. No one under the age of 16 may carry a firearm on museum grounds. Walk-in reenactors must register the weekend of the event on-site at the Registration Tent to receive event and parking passes.